Toyota makes a surprising tie-in to the World of Warcraft game with this viral ad for the Tacoma pickup truck. The commercial was developed in the style of machinima (machine cinema), an immensely popular trend where video game footage is manipulated to tell a unique story. Streaming video sites are rich to overflowing with examples of amateur filmmaker’s attempts at stories, spoofs and music videos. In the case of this ad, video-capture supposedly records the moment where a character uses a truck to attack a dragon. Player 1: I’ve gone ahead and equipped my Epic Axe. Player 2: Uuuuuh, switching to explosive arrows. Player 3: Yeah, I’m gonna equip myself with a little, uh… FOUR WHEELS OF FURY! Player 2 (in disgust) Uuuuuh! Player 3 drives Toyota Tacoma towards Dragon. Player 2: There’s no trucks in World of Warcraft! Player 3: Let’s do this! Player 3 and Toyota Tacoma are eaten by Dragon in one gulp. Dragon breaths fire at Player 2. Player 2 (as Toyota Tacoma is eaten) Uuuuuh. Dragon grasps chest in pain. There is a terrific explosion as Player Three and the Toyota Tacoma burst out of Dragon’s chest. Player 3: Did you see me lay down the law? I am the Law Giver! 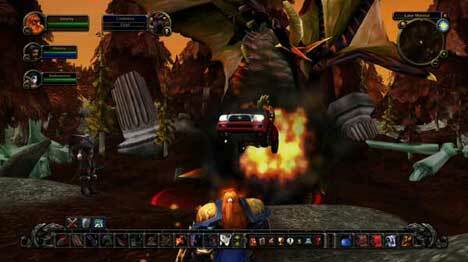 The World of Warcraft Toyota ad was developed at Saatchi & Saatchi LA, Los Angeles, by executive creative director Harvey Marco, creative director Steve Chavez, associate creative director/art director Dino Spadavecchia, copywriter Greg Farley, and agency producer Jennifer Pearse. “World of Warcraft has always had a rich history of humor and cultural references,” said Paul Sams, chief operating officer of Blizzard Entertainment®. “Taking part in a campaign like this is an exciting opportunity to offer a different perspective on the setting, and we hope it provides a good laugh for anyone familiar with the game. Filming and animation were directed by Greg Farley, Dino Spadavecchia and Steve Chavez via Hydraulx, Santa Monica. Music and Sound Design were the responsibility of Blizzard Entertainment. Audio post was mixed by Loren Silber at Lime Studios. The World of Warcraft machinima genre was made popular with the Leeroy Jenkins video on World of Warcraft and YouTube in 2005. Leeroy (sometimes called Leroy) is a player who unwittingly ruined his guild’s plans to raid the Upper Blackrock Spire dungeon. Unfortunately Leeroy missed the briefing and rushes in, yelling “Let’s Do This!” See more on Leeroy Jenkins at Wikipedia.